Psephisma is written in stone historical document from which emerge 2300 years old story about the roots of today’s Lumbarda. Discovered in the second half of the 19th century, at the top of the hill Koludrt, in the ruins of ancient water cisterns. Since those ancient days until today, were dedicated to it’s many studies of domestic and foreign authors. It is one of the few surviving proof of establishing a center in the ancient world in general and a superior source for the study of Greek colonization. Researchers are, besides, further intrigued about the fact that the settlement, which clearly confirms the Psephism, knows practically nothing. Had in any other case Psephism plunged into the darkness of history, this whole story probably would never have been told. Fortunately, the Psephism outlived their creators and their city, remained preserved until our days as a key witness to the creation of the first Lumbarda urban core. The Psephisma from Lumbarda is a stone tablet discovered in the second half of the 19th century in the ruins of the ancient cistern on top of the Koludrt hill in Lumbarda. It tells the story of how Lumbarda was founded two thousand three hundred years ago. The Psephisma from Lumbarda is proof of the first urban centre established in Lumbarda – a settlement of which little else is known, and without which the whole enterprise would have been ignored by history. 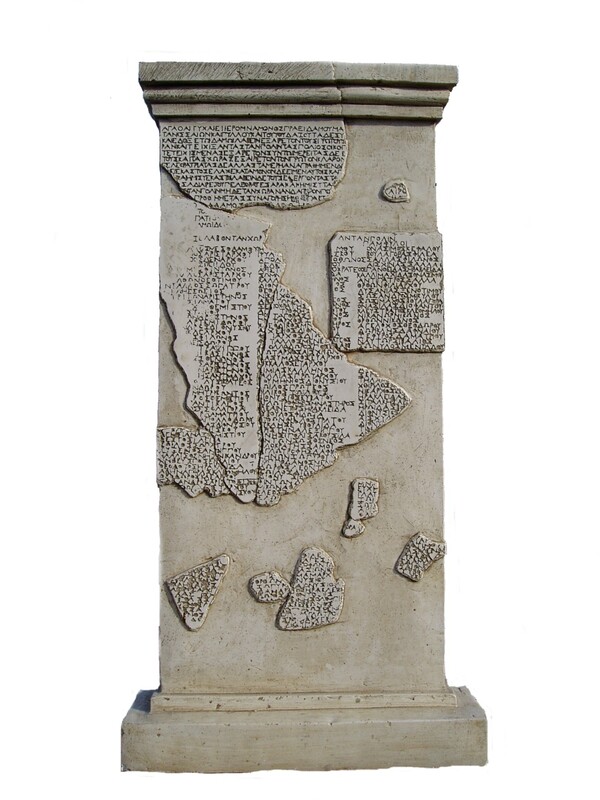 For research into the ancient world that tablet constitutes precious evidence of how people in the ancient world established a town, and is thus a marvellous source – widely used by Croatian and foreign authors – for studying Greek colonization. The Psephisma from Lumbarda is a tablet of red-brownish lime-stone surmounted by a triangular decorative panel, about 1 meter high and 13 cm thick, with inscriptions 69 cm wide. The text consists of two parts. The first records the decisions of the Assembly on the foundation of the colony and the division of land between the new settlers. The second part consists of a list of colonists divided into three Dorian tribes (phylae): the Dymanes, the Hylleis and the Pamphyloi. There follow the names of the first colonists, notably men. Approximately 180 names are preserved (some think that there were more, perhaps even around 240, which would be the majority of the approximately 300 names believed to have been recorded on the monument) classified into the three Dorian phylai. According to the Psephisma the founders of the settlement were Greek colonists from the islandof Vis– then called Issa. They were Dorians divided into three tribes or phylai. The Assembly which governed the domestic and foreign affairs of the polis consisted of representatives of each tribe. It is possible that they also elected the hieormnamonos – the most important state official. His duties extended over both secular and religious matters. He was elected annually and the people of Issa called the years by his name. The Psephisma from Lumbarda bears the name of the hieromnamonos Praxidamos. Pyllos and his son Dazos were probably the representatives of the local Illyrian aristocracy and the owners of the land that the people of Issa wanted to obtain. According to the Psephisma these two parties agreed on a contract, so that the settlement was founded in peace. We will never know for sure what made few hundred people from Issa set off to Lumbarda. Some believe that it was due to poverty and that the authorities of Issa successfully dealt that way with the problem of their poor landless citizens. That was a common practice in Greek colonization. But the position of the Lumbarda settlement was also of strategic importance. It could control the Pelješac canal, which was at that time one of the most vital seaways in theAdriatic. A settlement there would thus give Issa an opportunity to exercise some control over Adriatic traffic and trade. Apart from the Psephisma, which is kept in the Zagreb Archaeological Museum, finds from a destroyed necropolis at the foot of the Koludrt hill, kept in the Korčula City Museum and also dating back to the 3rd century BC, are the only current proof of the Isseian settlement in Lumbarda. Future research may well tell us more about this mysterious city. Translation of the Psephisma is based on the text from the Zagreb Archeological Museum.